Pack a swimsuit for the outdoor pool at the non-smoking Home2 Suites by Hilton Durham Chapel Hill which has free Wi-Fi and breakfast. Opened in 2016 this mid-rise hotel offers 103 non-smoking suites with free Wi-Fi flat-panel cable TVs sofas and kitchenettes with microwaves and dishwashers. Work out in the fitness room swim or tan at the outdoor pool indulge in the free continental breakfast and take care of work in the staffed business center. Pets are allowed for a fee and parking is free. 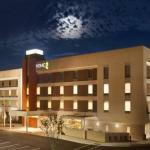 The hotel is off U.S. 15/501 within a quarter-mile of I-40 and two shopping centers. It's also within 15 minutes of Duke University to the east and the University of North Carolina at Chapel Hill to the southwest. Durham Bulls Athletic Park is four miles away. Raleigh-Durham International Airport is 17 miles away.